Armenian voters go to the polls this weekend to elect the first new parliament since the “Velvet Revolution” in the spring, when Nikol Pashinyan led street protests that toppled the former government led by the long-ruling Republican Party of Armenia. The Republicans are now on life support, polling in the low single digits, while Pashinyan’s alliance is expected to win an overwhelming majority. But the parliamentary campaign has nevertheless been a sort of reenactment of the spring’s political drama, dominated by sparring between Pashinyan and the Republicans, with the other parties often little more than bystanders. The December 9 elections should give Pashinyan a parliamentary majority for the first time; although he became prime minister in May he has been working since then with a parliament dominated by supporters of the old regime. Pashinyan’s allies hold only nine seats in the 105-member legislature. Pashinyan’s My Step alliance is projected to get around 70 percent of the vote according to opinion polls; although these are not particularly reliable in Armenia, analysts believe it’s a foregone conclusion that he will dominate. “It’s difficult to say whether it will be 60, 70, or 80 percent,” said Anahit Shirinyan, a Yerevan-based analyst for the think tank Chatham House. The campaign period has been unusually short, only two weeks, and My Step has been by far the most visible presence. Pashinyan has held rallies across Armenia, usually several per day, and in Yerevan campaigned person-to-person, leveraging his considerable charisma and wide popularity. 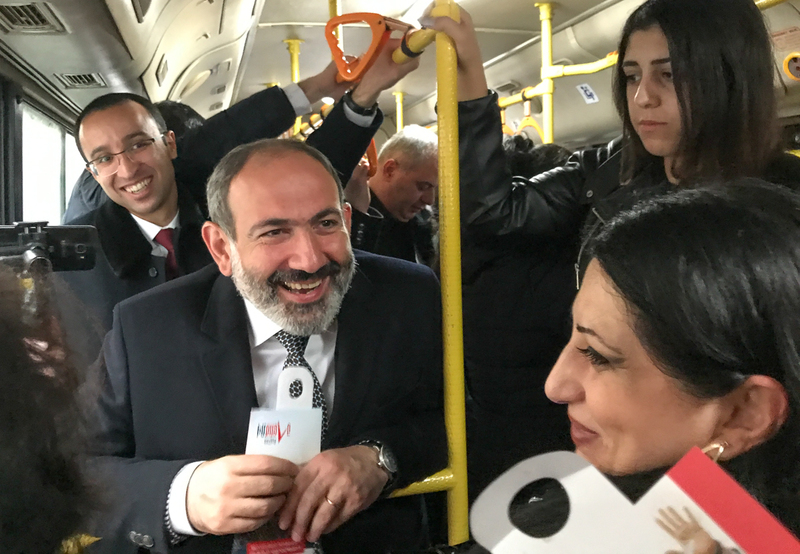 One day, after a morning of knocking on doors in Yerevan’s Avan district, he took a city bus back to his office in the center. Standing next to the back door, often nearly losing his balance as the bus lurched through Yerevan’s stop-and-start traffic, he greeted fellow passengers with a “hello” and a campaign leaflet as they boarded. Most shyly smiled, not knowing what to say to their prime minister, but one effusive 80-something pensioner blurted out “I would kill for you!” when he saw Pashinyan. “Please don’t,” the prime minister responded, to the mirth of the other riders. He then ventured a conversation with the prime minister. “Mr. Pashinyan can I ask a question? Will pensions increase?” Pashinyan asked him how much his pension was, and said that this year 85,000 retirees saw their pensions rise and that the increases would continue. While Pashinyan retains high approval ratings, his luster has faded somewhat – particularly among Yerevan’s elite – as his style has become increasingly erratic. Many have been alarmed by his frequently aggressive rhetoric, particularly against the Republicans. During one campaign event he said that he would personally “grab by the throat” and “throw to the ground” local officials who tried to pressure their constituents to vote Republican. In another case he said the country’s security services should “deal with” his political opponents. A European Union election monitoring mission said in a pre-election report that Pashinyan’s comments “provoke[ed] a wave of hate speech” against the Republicans. The Republicans, meanwhile, have been running by far the most aggressive anti-Pashinyan campaign, painting the new government as weak on national security and too liberal for Armenia’s traditionally conservative society. “If you are concerned about the degradation of traditional values, vote for” Republicans, some of the party’s billboards read. “At least on social media, we have seen some emerging skepticism towards Pashinyan’s government, including from both those who have been misled by ‘fake news’ disseminated by the Republicans and affiliated media, and others who are independent thinkers who see objective deficiencies in the performance of Pashinyan’s government so far,” Chatham House’s Shirinyan told Eurasianet. “There has been a big shift to harsh rhetoric” on both sides, she said. That has helped Pashinyan and My Step in some cases. The Republicans are widely hated in Armenia, and their presence in the race has allowed Pashinyan to use them as a foil, said Alexander Iskandaryan, the head of the Caucasus Institute, a Yerevan think tank. “It’s useful for them to have an enemy,” he told Eurasianet. The Republicans’ campaign has been relatively understated, with the party holding few public events. Armen Ashotyan, a senior member of the party and its campaign manager for this race, blamed Pashinyan. “It’s very difficult for our candidates to campaign because there is incredible pressure from state institutions, including the special services, police, etc.,” Ashotyan told Eurasianet. Unlike the early Christians, however, the Republicans’ best days appear to be behind them, and Ashotyan acknowledged that a third-place finish would be considered a success. “It’s better to be defeated standing up than to lose on your knees,” he said. Indeed, all the parties accept that My Step will be the clear victor and the jockeying is for second and third place. The most likely second-place finisher is the Prosperous Armenia party of oligarch Gagik Tsarukyan, which maintains a faithful constituency among rural and poor Armenians. Tsarukyan rented out Armenia’s largest events hall for a rally on December 5, and attendees surveyed by Eurasianet all expressed support for Pashinyan and his overthrow of the Republicans. One, 60-something Vartan Galustyan, said he voted for Prosperous Armenia in the last parliamentary elections, in 2017, and this year was still undecided between them and My Step. His decision, he said, was based on the fact that Pashinyan and Tsarukyan were the two leaders who would best be able to stand up for Armenia against Western powers who might try to force Armenia to adopt a more accepting stance towards gays. “How many peoples have disappeared from the earth? But we have survived, thanks to our mentality,” he told Eurasianet. Another, Sarkis Yezikyan, said he was a Pashinyan supporter but lost faith over the summer when the prime minister compromised on a pension privatization plan. “I believed him six months ago, but little by little I’m feeling that his words don’t match his actions,” Yezikyan told Eurasianet. Pundits project that the third-place finisher is likely to be either the Republicans or Bright Armenia, a party that is currently part of Pashinyan’s bloc in parliament but decided to run independently in this race. Bright Armenia’s close alliance with Pashinyan means that it might appeal either to liberals who are wary of Pashinyan’s more extreme actions, or those who want to maximize his hold over the parliament. According to Armenia’s constitution, one-third of the seats in parliament are reserved for the opposition, meaning that if Pashinyan’s My Step gets enough votes for more than two-thirds of the seats, the excess seats will be distributed to other parties. The constitution also stipulates that three parties or blocs must be represented in parliament, so that even if the second and third place finishers get fewer votes than the threshold, they’ll get in regardless. That has led to some strategic voting, with some Pashinyan supporters voting for other parties in order to block the Republicans from making it in. Joshua Kucera is the Turkey/Caucasus editor at Eurasianet, and author of The Bug Pit. Ani Mejlumyan contributed reporting and the video.